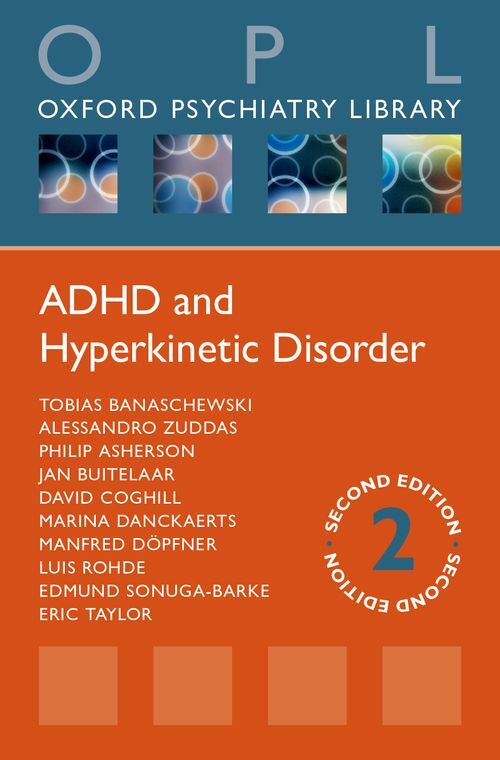 This pocketbook serves as a concise and practical guide to the management of ADHD for child and adolescent psychiatrists and child psychologists, paediatricians, trainees, psychiatric specialist nurses, interested general practitioners, and other mental health professionals. The pocketbook provides a user-friendly introduction to the clinical understanding, evaluation, and treatment of ADHD. This edition has been updated to include new DSM-5 diagnostic criteria (May 2013) and to reflect more published studies on ADHD in the adult population, along with new data on the CNS stimulant drug LDX (Lisdexamfetamine Dimesylate). Tobias Banaschewski, MD, PhD, is Professor of Child and Adolescent Psychiatry at the Medical Faculty Mannheim of the University of Heidelberg and Medical Director of the Department of Child and Adolescent Psychiatry of the Central Institute of Mental Health in Mannheim, Germany. Dr. Banaschewski studied psychology and medicine at the University of Marburg in Germany. He worked as Clinical Assistant in Adult Psychiatry in Marburg and as Clinical and Research Assistant in Child & Adolescent Psychiatry at the University of Gottingen, Germany. ; Alessandro Zuddas is Professor of Child NeuroPsychiatry at the Department of Biomedical Sciences, University of Cagliari, Cagliari, Sardinia, Italy. ; Philip Asherson, MB,BS, MRCPsych, PhD is Professor of Molecular Psychiatry at the MRC Social, Genetic and Developmental Psychiatry centre at the Institute of Psychiatry, King's College London, and consultant psychiatrist at the Maudsley Hospital. He earned his medical degree from The Royal London Hospital and his doctoral degree from the University of Wales. He was an MRC Clinical Research Fellow in the Department of Psychological Medicine & Institute of Medical Genetics at the University Of Wales College Of Medicine in Cardiff, where he worked on molecular genetic studies of schizophrenia. His current work focuses on clinical, quantitative genetic and molecular genetic studies of ADHD across the lifespan. He has contributed to the development of mental health services for adults with ADHD in the UK. ; Jan Buitelaar (MD, PhD) is child and adolescent psychiatrist, and professor of Psychiatry and Child and Adolescent Psychiatry, and head of the Department of Psychiatry of RUNMC, and of the Karakter Child and Adolescent Psychiatry University Centre. He has been involved in numerous medication trials in children and adolescents with ADHD, Conduct Disorder and Autism Spectrum Disorder. He is Editor-in-chief of European Child and Adolescent Psychiatry. He is further active in genetic, brain imaging and cognitive studies, and has published over 240 peer-reviewed papers. ; David Coghill (MB ChB MRCPsych) is child and adolescent psychiatrist, and senior lecturer in Child and Adolescent Psychiatry, at the University of Dundee and Honorary Consultant Child and Adolescent Psychiatrist in the Tayside Child and Adolescent Mental Health Service. He has been involved in several trials in children and adolescents with ADHD and Conduct Disorder and is currently the global lead investigator for two large multinational clinical trials. He is also active in genetic, neuropsychological, neuropsychopharmacological and quality of life research. ; Marina Danckaerts (MD, PhD) is a Clinical Professor at the University Hospital Leuven and the Katholieke Universiteit Leuven and is also Head of the Department of Child and Adolescent Psychiatry. She is a national Principle Investigator for several international multicentre clinical trials. ; Manfred Dopfner is a Professor of Psychotherapy in Child and Adolescent Psychiatry at the Department of Psychiatry and Psychotherapy of Childhood and Adolescence (University of Cologne) and a Chief psychologist at the Clinic for Psychiatry and Psychotherapy for Children and Adolescents at the University Hospital of Cologne. Prof. M. Dopfner's research interests are in the field of epidemiology of Mental Disorders and development and evaluation of psychosocial diagnostic procedures and psychotherapeutic interventions, with an emphasis on ADHD, anxiety and obsessive-compulsive disorder, tic disorders and depressive disorders in childhood and adolescence. ; Luis Rohde is a Professor of Child Psychiatry at the Experimental and Molecular Cardiovascular Laboratory and the Heart Failure and Cardiac Transplant Unit, Cardiology Division, of the Hospital de Clinicas de Porto Alegre, Porto Alegre, RS, Brazil. ; Edmund Sonuga-Barke is a Professor at the Developmental Brain and Behaviour Lab, Psychology, University of Southampton, Southampton, UK. His current and recent research is on childhood psychiatric disorders with a special focus on ADHD and related disorders. ; Eric Taylor is Emeritus Professor of Child and Adolescent Psychiatry at King's College London Institute of Psychiatry; and an honorary consultant at 'The Maudsley'. He has researched, practised clinically, and taught child neuropsychiatry since 1971. He has been a Trustee of the National Academy of Parenting practitioners, Chair of the Association for Child and Adolescent Mental Health and a Non-Executive Director of the South London and Maudsley NHS Foundation Trust. His research won the Ruane prize from NARSAD for severe child psychopathologies and he is a Fellow of the Academy of Medical Sciences and an Honorary Fellow of the Royal College of Psychiatrists.